Pepper spent some time in breeding, but was mostly used for research, including some 307 knockdowns, 36 punch liver biopsies, one open wedge liver biopsy, six cervical biopsies, 10 lymph node biopsies, and four bone marrow biopsies. In the lab, Pepper was plagued by fear and anxiety, and would rather starve herself than face an unpleasant situation. Pepper was born in 1970 and spent her first 27 years in research, first at a Merck, Sharp & Dohme laboratory, followed by seven years at the Buckshire Corporation. When she became too strong to control, she was sent to the Laboratory for Experimental Medicine and Surgery in Primates (LEMSIP). Today, at Fauna Foundation, Pepper is still prone to being nervous, but she is also a sweet, gentle, and loving lady. She is attentive to all of her chimpanzee friends, especially their grooming needs. Now, she meets her days eagerly and with interest, rather than with the sad, blank stare of her former laboratory life. Pepper spent 27 years in research labs, where she marked time staring blankly between the bars of her cage. Finally, Pepper was retired to sanctuary at Fauna Foundation where, rather than staring out of a lab cage, she spends much of her time sitting by a chimpanzee-proof bay window, unimpeded by bars, looking out over the farm or strolling through a long, overhead chute system that allows her to walk the acres. In front of those bay windows or in special spots along the chutes at Fauna, Pepper often makes herself a nest in which to sleep using the blankets and sheets she is given every night – a simple pleasure she was so long denied in the labs. Sometimes Pepper will add straw to her bed, which she will keep for several days, adding new materials each night. These simple things – an unobstructed view, a walk, a night nest, and the joy of varied daily activities – do not make up for the 27 years that Pepper endured in research. But they do provide Pepper with, perhaps for the first time in her life, a view of her world without bars and the comfort of a world far bigger than a 5′X5′X7′ laboratory cage. 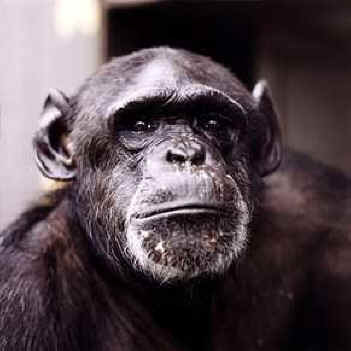 Please take action to end the use of chimpanzees in research in the United States.